Which Band sacked Lemmy in 1975? Where did the name Motorhead originate? 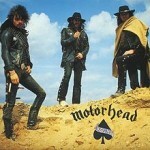 With which Band did Motorhead record St Valentines Day Massacre? In which Year did Ace of Spades appear in The U.K. Top 20? Motorhead performed the theme tune to which Horror Film?